and go run your own race. When was the last time we asked ourself, "Who am I?". And what was our answer to that? If we were to ask ourself the same question again today, "Who am I? ", what will our answer be? Will it be the same? Or will it be different? What used to be okay for us, may not be okay for us now. What we used to find enjoyable doing, may not be so enjoyable today. We may have different habits now. Different hobbies. Different tastes in music and fashion. Different friends. Different belief systems. Different life. So where did that old self go? Some say old selves die. And some say old selves evolve. In truth, old selves are transformed as we grow. We change because we have grown out of our old self. We want to be better because we know better. And this is the kind of competition that we can cultivate as we move forward. Competing with ourself - or in other words, running our own race. Not because we're not good enough to compete with others, but because we understand that people lead very different lives. It can be misleading to judge other people's lives through posts they share on social media. While it can be healthy to compete because we want to improve ourself. It can be unhealthy when we compete because we think that we do not measure up. Know that success doesn't come overnight. It is actually a never-ending process. We reach different kinds of success as we go through life, because we are on our own unique journey. Accept this journey. Be proactive. Be bold. Be our own unique self. Happy Supermoon Lunar Eclipse! The Moon is joining Uranus Rx in Aries forming an opposition to the Sun and Mercury Rx in Libra, marking an extra potent and electric Full Moon in the sign of the Ram. This Full Moon that usually falls in late September or early October also happens to be called a Harvest Moon. Astronomers define the Harvest Moon as the Full Moon that is closest to the autumn equinox. While according to Native Americans, it is a time when corn is supposed to be harvested. At the peak of harvest, farmers can work late into the night under the light of this Moon. This will also be the biggest Full Moon of 2015, because on the very same day the Moon will be at perigee — its closest point to the Earth, making it a Supermoon. Full Moons are a time of culminations. A time when we can reap what we have sown since the New Moon. A time when we get to see our life from a new standpoint and make new decisions based on a brand new perspective. With the Full Moon happening in the first sign of the zodiac, we get to start right from within. Ruling the First House in Astrology, or the House of Self, those born under the sign of Aries are known for their independent, optimistic and courageous nature. They may seem impulsive, short tempered, or self-involved at times, but they are generally upbeat and passionate people who will always look out for their friends with sincere and heartfelt generosity. 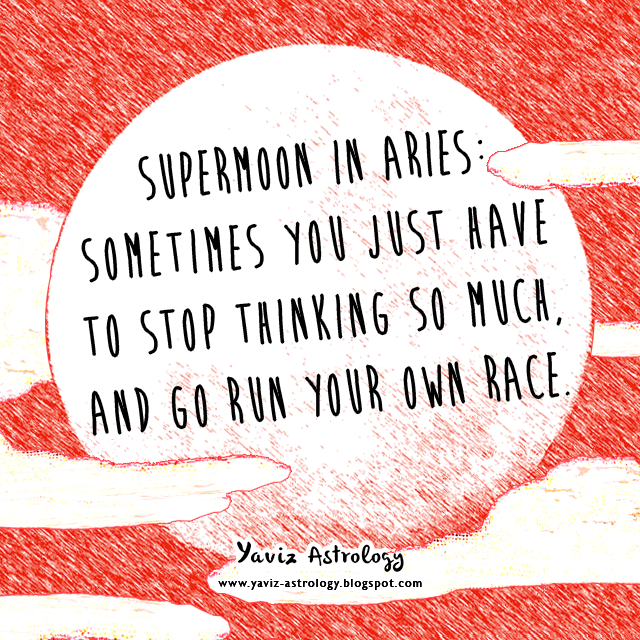 The Full Moon in Aries encourages us to get back in the driver's seat of our life. To tackle old problems with fervour. To let go of the past once and for all. To take charge and become a better leader in our own life as we make our unique mark on the world. With the Moon forming a trine to Saturn and Venus, get in touch with what we feel and go with the flow of the brush. We have a flair for colours so we can expect to have fun with ideas and watch them take form into something we've never seen before. Even if we are not artistically inclined, our ambitions in everyday life should reflect our newfound inner freedom. Important friendships or partnerships can be formed if we're open to sharing in a whole new way. People are more responsive when we can be honest and truthful while being diplomatic at the same time. We could find just the right person to talk to regarding our personal or professional issues. A stronger sense of confidence will take hold as we believe more in ourself, so keep this in mind as we begin the new week. Another great way to work with the Aries Full Moon is to escape somewhere and go on a mini adventure. It doesn't matter where we go, as long as we can devote some time to being playful, carefree and imaginative. This investment in time will bring in positive energy, and make way for new creative ideas. Are we aware that there is actually an inexhaustible source of creativity within us? All we need to do is connect with the flow of creative energy inside us. Release our fears and doubts, but do not push them away. Instead, challenge them courageously. While we do so, allow our joyful inner child to surface. Are we also aware that the inner feeling of happiness does not depend on external circumstances? The feeling of happiness is a conscious choice. What will we choose? The Moon is also forming a square to Pluto which has recently ceased his retrograde motion and gone direct, and our deep sensitivity can come out to work as we learn to trust our instincts more. We will be able to concentrate with renewed energy on assignments we usually would find tedious. If any problem does arise, we will have no problem in getting to the heart of it. Look closer with an open mind and we will see that the solution can be found sooner than we expected. Sometimes it's good to see a situation for what it really is, and to let ourself enjoy the learning aspect of it. We can take pleasure in a good challenge to get that brain power going again. This truly is our opportunity to make changes. To pay attention where needed. As I was writing this blog post, I saw a lizard walking through the garden. And I thought, what a fascinating omen. According to ancient symbolisms, lizards represent our dreams as well as powers yet untapped within us. Powers of transformation and regeneration are available to us so that we can move beyond our wounds and let healing take place. The lizard spirit animal teaches the wisdom of regeneration that we can tap into. It is only when we can let go of old ideas, patterns and belief systems that the process of transformation can take place. Just like the lizard that likes to bask in the warm rays of sunlight, we too can bask in the light of our own soul's radiance. By understanding the importance of having trust in ourself, we can begin to appreciate ourself more and connect with our inner strength. It is time to move forward with courage and self-assuredness into a new chapter of our life. Affirm: I am my own's best ally. 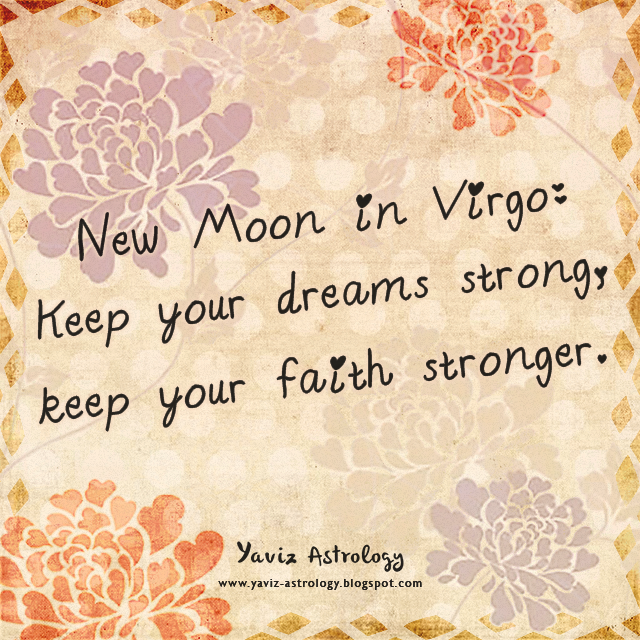 New Moon in Virgo: Keep your dreams strong, keep your faith stronger. They say it's not enough for us to have dreams, we need to have faith in them. Because if we don't have faith in them, who will? And where does action fit into all this? Action has always been a crucial part in dream building. Small action steps are just as important as big action steps. The little details that often go unnoticed or happen behind the scenes. They may seem tedious at times because they have to be done whether we want to do it or not. The paperwork we have to do, the little errands we have to run, or anything that has to be done regularly every day, every week, every month, or every year. They are here to teach us about the art of time management. A good time management includes an order of priority — what needs to be done first and what can be done later. Setting realistic schedules by considering the amount of time we need, and leaving in extra time for those unexpected things that may come up. With the Moon and the Sun together in Virgo, it is important to not just work hard, we also need to work smart. As we start a new beginning, remember that getting things done is all about the approach we use to schedule our time. And each action step we take brings us closer to that goal or dream we have. So keep our dreams strong and faith even stronger on our journey forward. Happy New Moon Solar Eclipse! The Moon is conjoining with Jupiter and the Sun in Virgo, marking an especially vibrant and intellectual New Moon in the sign of the Virgin. A Solar Eclipse occurs when the Moon passes between the Sun and the Earth, and the Moon fully or partially blocks the Sun. Its effects can be felt up to six months after the actual date of the Eclipse and this can be a great time for a mental or physical overhaul. Ruling the 6th House in Astrology, or the House of Health, the Virgo energy is all about maintaining good health and the ability to cope in the face of adversity. Those born under this sign are known for their analytical, observant and precise nature. They may seem overly picky, skeptical or critical at times, but they are generally happy to help others. Being methodical and efficient gives them great joy and they will always work for the greater good. When the Moon is in Virgo, we can feel more inspired to get things done. Whatever area of our life we may be focusing on, no detail will be overlooked as we feel more ready to look deeper into any issue. We can have a more active mind that is always thinking and analyzing, which can be a good exercise for our problem-solving skills. Just make sure to learn to have more trust and faith along the way. Planet Mercury rules the sign of Virgo. Just like the ancient Roman Mythology, the Winged Messenger is a bundle of mental and physical energy. Communication, intellect and awareness lie within Mercury's domain. With the Moon forming an opposition to Neptune Rx and Chiron Rx, we get back in touch with our deepest emotions. There is a new way to heal an old situation as we are able to see it from a renewed perspective. Now is not the time to make decisions based on our feelings, but rather try to use our head sensibly. There may be a warning siren going off in our head when we are about to take the same road, so trust our intuition and take another turn. We will flourish in this new direction where we can expand more in a lifelong dream. Sometimes an opposition between planets can also mean that we have been working too hard on a situation and that it's time for us to take some rest. Perhaps we have been a little too uptight, anxious, and holding onto fear lately. The burden of carrying our past around has made us weary. We are repeating a pattern because of unfinished emotions from the past. Trust that we are now guided to let go of worries and anxiety, and that we are being divinely guided and protected on our path. It is safe for us to let go of fear and relax. In fact, we are safer when we are emitting a more peaceful energy because that is what we will attract. Keep our Heart Chakra open. Forgive those who may have hurt us and forgive ourself too. This is our soul's request to us: Let the past go. The Moon is also forming a trine to Pluto Rx and a sextile to Saturn, and we work in clever ways to shift things in the direction we desire. We could find it easier to stay clear of any difficulty as we discover that with a positive attitude, we will know exactly what to do when the time is right. There truly is no better time to focus on what we want to accomplish and plant new seeds than this New Moon. What we do and say will define the path towards our final goal. Try to focus more on our progress at this time - instead of expecting perfection from ourself. We are on the right path, even if it feels like we are moving rather slowly. Appreciate and love ourself more. Relax the tension in our body. Get a massage or exercise. Dismiss all the things that no longer serve our highest purpose. Find a better balance between work and rest, as well as between the material and the spiritual. Pray for healing and release from all emotional traumas and negative mental patterns. As Saturn makes his transition from Scorpio into Sagittarius, we can safely move forward, knowing that we have learnt our sacred lessons. The purpose has been served in a relationship or situation. There is a blessing in disguise. The Virgo New Moon helps us recognize this blessing in the midst of an apparent challenge. Notice how much better we feel when we can finally shift our perspective and think more positively about ourself and others. This is our new route.